Welcome to Valyrian Steel. Your source of officially licensed replica weapons and armor from HBO® 's hit TV series Game of Thrones®, and George R.R. Martin's A Song of Ice and Fire book series. "The shine and detail of the crown is what makes it worth it. It's as brilliant as it is in the pictures and totally wearable (although you will probably have to adjust your hair a bit to make it look good). No complaints about the crown itself. The base itself and the metal medal centerpiece is very nice, but the 4 swords are manually attached to the base when you get it and the attachment rods are slightly uneven in length. Mounting the crown on them will leave the crown a little wobbly. I just push the crown all the way to the back and it looks very nice. This isn't a big issue to me since no one will be touching the crown anyways. " "Very impressive! Dignifies my bookcase and makes a great addition to me collection of bibelots. Sturdy construction and nice finish! Good value." "I'm glad I spent my money on this, it's beautiful! The crown is somewhat heavy as expected but looks so glorious and shines in a room. I highly recommend it!" "Folks, this is a prop replica so those of you expecting a solid gold crown that fits your big heads then go pay a truck load of money for one because this replica is beautiful, for the price, for the base, and for the design. It looks good anywhere you put it in fact it makes everything around it look bland. Great product very happy with mine and it actually fits my head nice if I wanted to boss people around." "#28 out of 1500 and I have to say it\'s pretty. But it\'s a lot prettier for 150. I definitely think it\'s overpriced, and as the guy said, it is just okay. 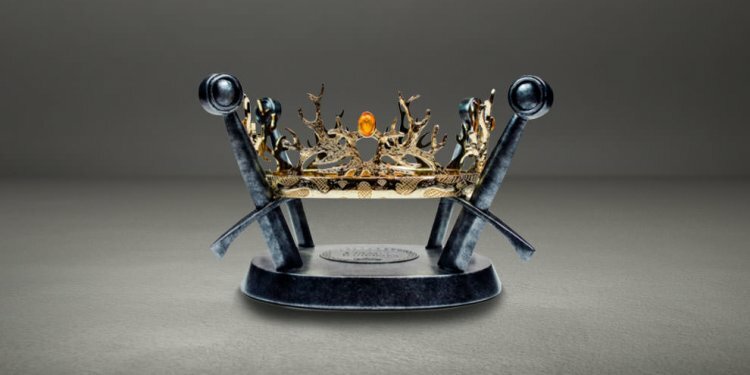 I like it because it\'s a game of thrones crown and the stand with the plague piece is actually very pretty. I think the stand makes it look greater than it would without it. It does not look like plastic. The stand looks like Rockish metal. The crown is also small, so don\'t expect to wear it. Just know you probably won\'t feel like you\'ve got your moneys worth, but it\'s still cool." "Package just arrived: 473 of 1500. Joffrey must have a small head. This crown wouldn't have fit around King Robert's head; that's for sure. But this is a display piece and not for practical costume wear. The crown and stand look okay if you don't inspect them closely. But when you do there are some flaws. In the photos the stand is made to look like metal finished swords but the actual stand itself looks and feels very plasticy and has a haphazard drybrush finish and looks like stone instead. The crown itself has a nice weight to it like you'd expect. The depth of field effect in the image gallery hides you being able to see the backside of the replica gem. The "inset" gems look obvious to be glued on as opposed to inset. The crown's "lustrous gold effect" leaves a lot to be desired as well and continues with the plasticy theme which is a shame since the crown is metal. Overall it's an "okay" piece but nothing to write home about." "The crown itself makes up for the lackluster base. Great detail and shine to it. I was a little disappointed with the base as the swords aren't quite all the same length. When on display, that's meaningless and it will be a great addition to any fan's collection."